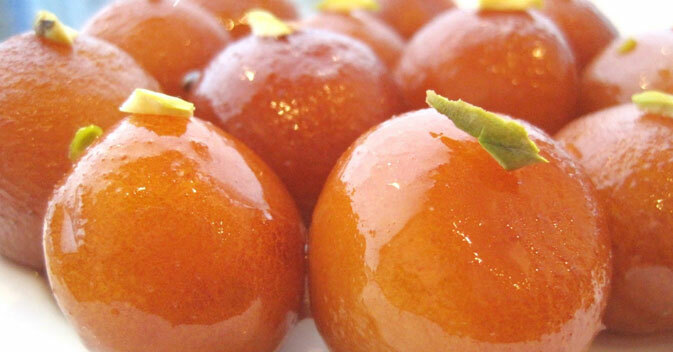 Gulab Jamun is one of the most popular sweets for all occasions. Be it Diwali, Raksha Bandhan or wedding, gulab jamun finds its place in almost all the festivities. Besides, it is tasty and delicious too. No doubt, gulab jamuns are high on calories, yet people love to gorge on pieces of gulab jamuns because they are simply irresistible! So, what are you waiting for? Make this special yummy sweet dish for your brother and other family members and give all of them a delight. Check out the recipe of gulab jamun at sendrakhi.com. Procedure Take a pan and heat butter in it. Immediately remove from fire and add bisquick, carnation powder and yogurt and blend well. Knead into a dough and if need be add milk to it for smooth dough. You can even add cream to the dough, but this is optional. Cover and leave this dough for sometime for say about half an hour. Then, make small balls out of this dough. In another make the sugar syrup. Add sugar in water and boil it. To this water, also add cardamom seeds and lower the flame. Let the water boil for ten minutes. Let the water reduce to half. After it is done and remove and let it cool In another pan, heat the oil and fry the small balls until golden brown, dark brown or black as per your interest or liking. Soak these fried balls in sugar syrup for few hours. The gulab jamun is ready to be enjoyed by both sisters and brothers. Tip: You have the liberty to serve gulab jamuns hot or cold. These are delicious and simply superb gulab jamuns!